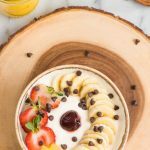 Banana Split Breakfasts are my absolute favorite. 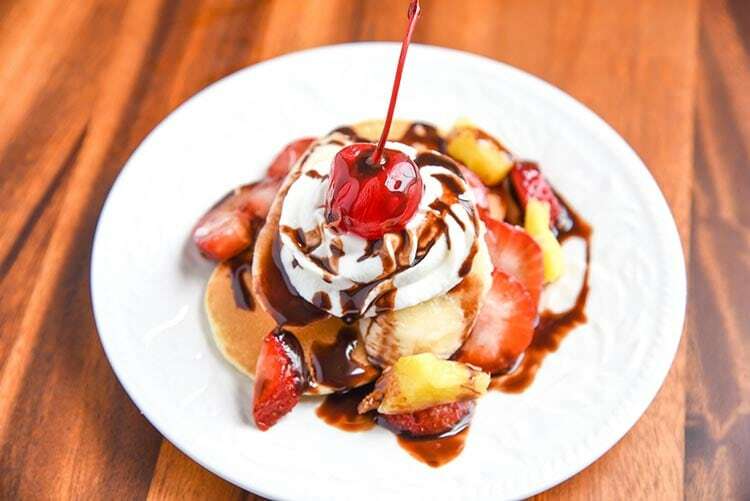 Especially this Banana Split Waffles Breakfast! 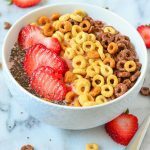 Fun twist on a classic dessert recipe turned into a tasty breakfast recipe. It’s safe to say I have an obsession with banana split recipes. I mean who doesn’t love a good banana split? 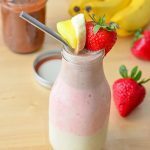 I love all the flavors of a banana split, so I try to incorporate them into more than just a dessert recipe. 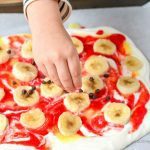 Growing up my mom made our banana splits with tons of nuts. I hated nuts growing up so I never touched a banana split. 😮 Now I actually love nuts, but not on my banana splits, if you want you can absolutely add the nuts if you’d like though. 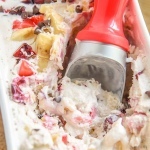 There’s just something incredible about the flavor combo you get in a banana split and it really shouldn’t be limited to just ice cream, am I right? I love using greek yogurt as the whipped cream on our waffle breakfast, but if you want you could use whipped coconut cream or even regular whipped cream. 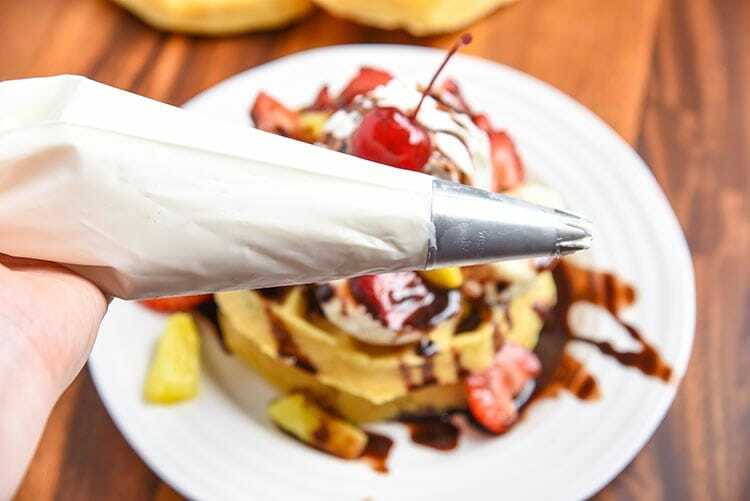 Using yogurt is so much fun and we actually put it into a piping bag. 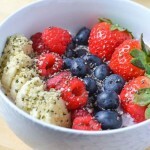 I like to use regular greek yogurt and add in a little vanilla extract. If you want you could even add in maple syrup! I actually use maple syrup sometimes instead of the vanilla. It makes it sweet and tastes like the maple syrup! Using the greek yogurt with the waffles is so much more fun and doesn’t turn to liquid fast and really holds up if you’re serving a ton of waffles. 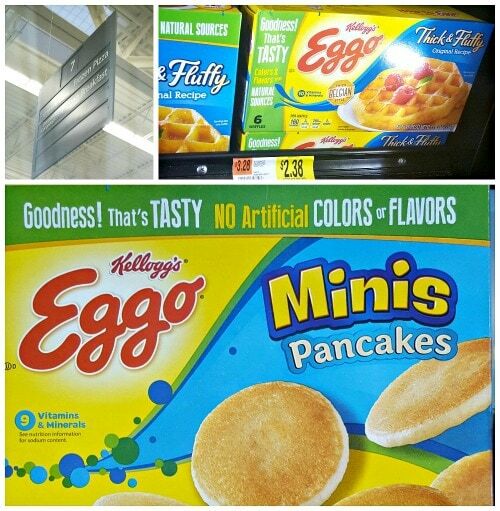 Earn $0.50 when you purchase any ONE Eggo® Thick & Fluffy Waffles variety, 6 ct. pack only at Walmart. Available while supplies last. 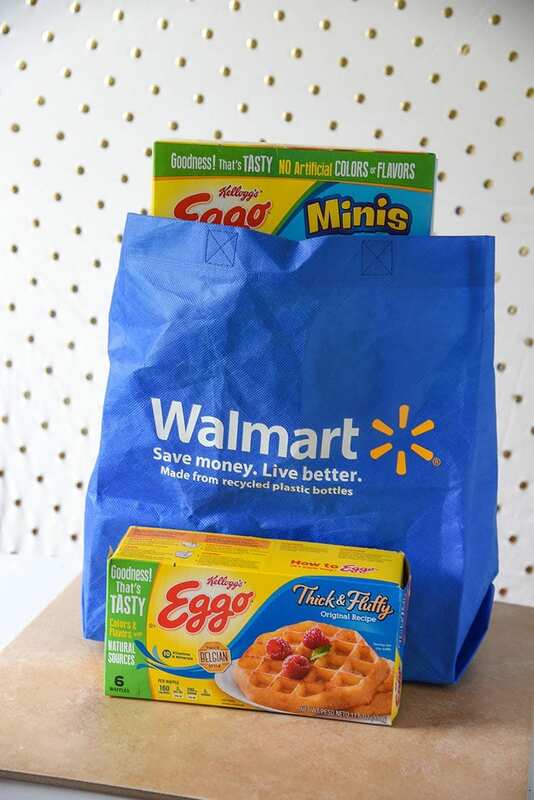 My mini chef loves helping me shop for our Kellogg’s® Eggo® Thick & Fluffy Original Waffles at Walmart! They’re located right in the freezer section and super easy to find. 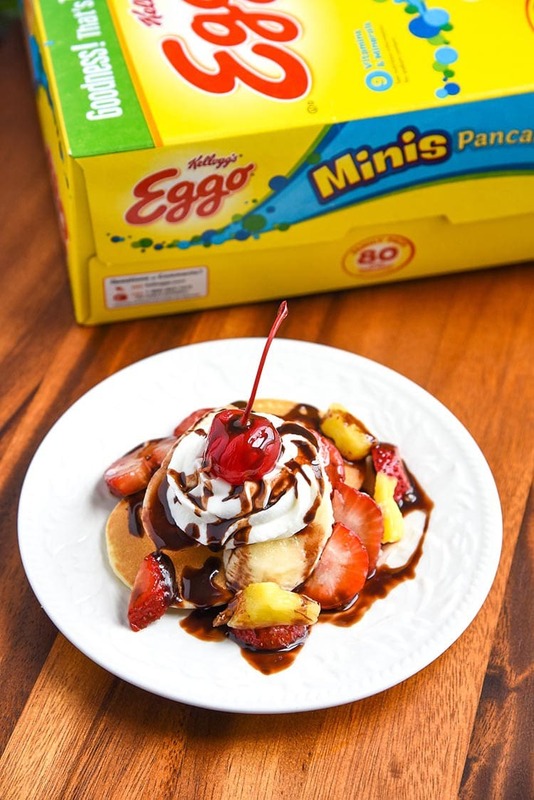 She even picked out her favorite too – Kellogg’s® Eggo® Minis Buttermilk Pancakes. When I make them for her, she has them with strawberries, blueberries, and greek yogurt with a tiny bit of maple syrup, we’re enjoying the mini pancakes as banana split pancakes too! 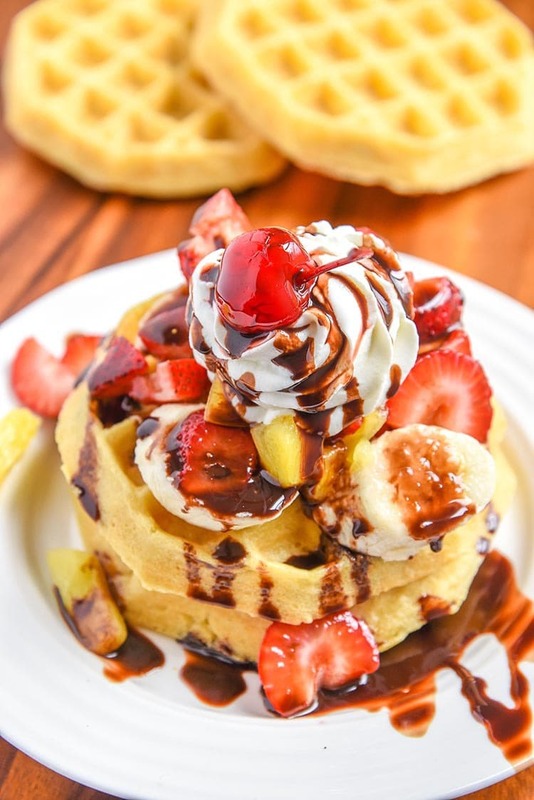 Breakfast fun with Banana Split Waffles Breakfast! 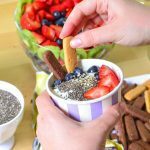 A fun twist on a classic dessert recipe turned into a tasty breakfast recipe. Toast your waffles until desired crispiness. Top one waffle with half of the chopped strawberries, pineapple, and sliced banana. 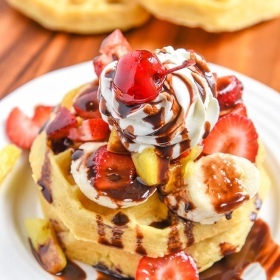 Then top the toppings with another waffle and use remaining fruit. Mix together the yogurt with vanilla extract and pipe on top. 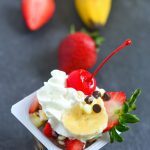 Drizzle with chocolate, top with a cherry, and enjoy! 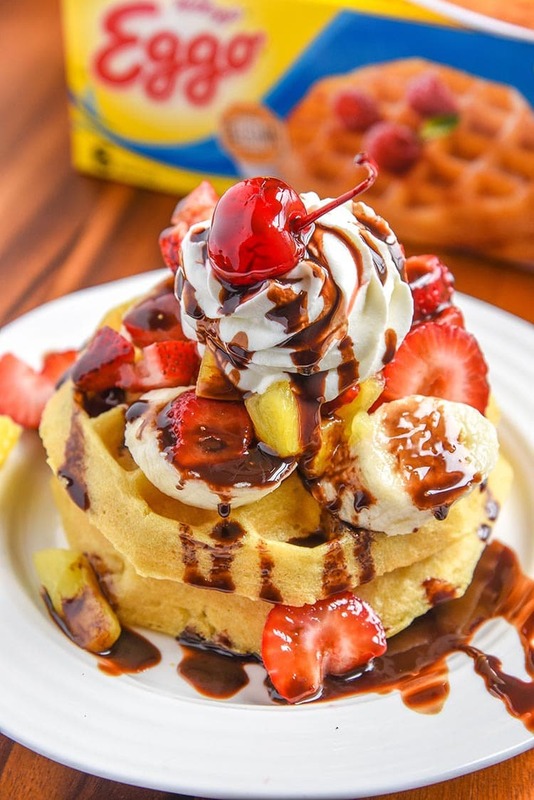 Kellogg’s® Eggo® Thick & Fluffy Original (6 ct or 12ct) waffles were made for this topping. They can stand up to the loaded toppings. They’re seriously so fluffy!